9ct Yellow Gold Diamond and Pearl Pendant on a trace chain. 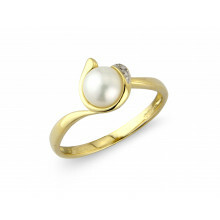 The 7mm Pearl is wrapped sumptuously by yellow gold with 2 diamond highlights set in white gold prongs. 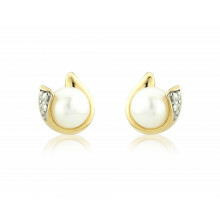 The Pearl is the stone for the month of June and its qualities include good luck and protection. Delicate trace chain has a length for 16" which is extendable to 18" with bolt and jump ring clasps. A suitable gift for many Geminis and Cancerians.